It's been one whole year since I last wrote to you. Perhaps this is a good practice, a yearly practice, of coming to a place where I decide that I'll choose to love you. For me, this is choosing to be brave. In all honesty it would be easier if I chose to ignore you. But here we are. I'll be truthful: I've been sitting here for awhile. These love letters tend to feel agonizing and take so many hours to write. I can't help but think of my sister. Her body is vastly different than mine this year -- she's blooming with another life, a tiny boy forming deep inside of her. But me? There's nothing new about me. Just one year older, a few dreams slightly closer, hopefully a handful more wisdom in my brain. Body, we've had some adventures this year, haven't we? Feet, you were covered in red African dirt in May -- you watched the burnt clay swirl around in the drain while you were showering, and as you washed clean, you prayed the red stain in your soul wouldn't do the same. You want Africa to stay fastened with you for as long as possible. Legs, you danced in the kitchen this past summer as you worked at camp. Hips, you shimmied and twirled in the barn while the white lights twinkled and the music played. Mouth, you spoke each Tuesday on bravery and Jesus' love and the fact that bravery and Jesus are strongly connected with freedom. Lips, you sang songs and led worship, even though you felt terrified and vulnerable to be leading in that way. Arms, you were strong as you held Eve -- that baby girl you named in a crowded, hot hospital in the centre of Uganda. You try and pray for her everyday. Eyes, you have seen beautiful things: gorgeous African wildlife, and sunsets that seemed as if Jesus took the best brand of watercolours and dipped them across the sky. And do you remember those stars, Eyes? When you were in the midst of Uganda, when you stretched your toes against the Jeep seat and stood up, your head up out of the roof, your eyes scarcely believing the stars that were in front of you. There were more white stars than black night. They made you tremble. Hands and fingers... it's no secret that you're the favourite. You paint and write and touch. You make art and write letters and give those letters away. You play guitar (poorly) and create fine, lovely things. Body, we have been places, and met people, and heard stories, and have written words, and have painted art. We do things. We do brave things. We are enough. We are adequate. We are worthy. We are significant. I'm deeply sorry I don't tell you this more frequently. I'm deeply sorry I don't often love you. Body -- thank you. Just, thank you. Now it's your turn. Write yourself a letter! A dear friend of mine also decided to write one. You can read hers here. It will be hard to write it, but it will be worth it. Remember: be honest, but please, be kind. You deserve kindness. This is day eight of the series 31 days of choosing brave. You can click here if you'd like a list of all the posts in these series, updated each day this October. If you would like these posts directly delivered to your email inbox, subscribe below. Have courage. Be audacious. Taste boldness. Choose brave. This is what I want for you over almost anything, dear heart -- to choose brave. Because it is a choice, isn't it? It's a choice and not a feeling. If brave was a feeling you would still be curled up beneath your white comforter over there in the corner. If brave was a feeling you'd never pull out your brushes and your paint jar and your watercolours. If brave was a feeling there would be no blog and there'd be no stories, because I doubt you'd ever feel brave enough to say what you'd like to say. No, brave is not a feeling. Which means only one thing: it's a choice. Dear heart, when you're fearful (which you so often are), I urge you -- choose brave. Dear heart, when those crushing feelings of inadequacy threaten to devour you, I urge you -- choose brave. Dear heart, when you are lonely and hollow and seem like you could disappear for awhile, I urge you -- choose brave. You, my heart, have so much to offer this wide world. Words and art, stories and paintings, but more than that, too. So much more. Believe that you have contributions to offer. It's okay to be scared. Just please, don't let that stop you. This is day one of the series 31 days of choosing brave. Each day this October, I'll be writing on what it looks like to choose bravery. You can click here if you'd like a list of all the posts in this series. If you want to make sure you don't miss a day, feel free to subscribe below. You are a poem, a love letter, an untold story. You are adventure and loyalty, justice and bravery. You are a slow dance waiting to unfurl. You are the stars sprinkled against the pin holed sky; a constellation that stretches long and far and wide. You are a flickering candle light that cannot be extinguished. Your light keeps burning, somedays a little dimmer than the last, but it never stops blazing. You're igneous and fiery, passionate and essential to the rotation and the axel and the spinning of this Earth. You are the ocean: majestic, strong, and a feeler of many things. You are dreams, desires, unrelenting aspirations. You are peaks and hills and mountains, cobblestone pathways and white, churning waters. You are all the places your feet may take you, all the faces your hands may reach out and touch. You are tidal waves and wild flowers, a water-coloured piece of art. You are lungs heaving oxygen and breath. You are blood bursting and seeping through veins. You are alive and you are hopeful. But most of all, you are a person. You will be hurt, and you will hurt; you will be love, and you will love; you will be life, and you will live. And when the time comes, when the sun starts to glow lower in the sky casting the rest of the Earth a burnt peachy orange, you will open your lips and begin to tell your story. The people will lean in and listen well, because they'll know what you have to say is important. They'll know your significance because it will be written like a song across your flesh, and the strings of a guitar will be plucked and you will start to sing. Marked by scars and bruises and raspberry kisses, you are a person. And that is the most exceptional thing in the world. I see the girl and I know she's forgotten it. I know this because she reminds me of someone else I know, someone I know well, someone who seems to forget it everyday; most days every hour; somedays every minute. The girl's forgotten her worth. She's mixed it up with other things that don't nearly matter, believed the lies that it's a quality you must earn. You are brave because you decided to do today. You allowed your feet to hit the floor. You got up. You showed up. You woke up. Or maybe you didn't, but you will. There will be a day where you will, and you are brave now, even before that day comes. You are loved and I know this because you are here. The gentle hands that carved the ripples in the sea carved the bridge in your nose, and the roundness of your lips, and the arches in your feet -- the same feet which will take you places you can't yet dream of. You are alive even if life feels like a miserable, pitiful thing. But you have passions welling up inside of you, I know they're there, though they might feel hidden right now. And you will create beautiful things, beautiful stories, because that is who you are: a beautiful, intricate, untold story. You are filled with courage and I don't care if you're also filled with fear, because when you are courageous you will most likely still be afraid. And that is okay. I believe courage is when you choose to step past that overwrought, frantic place, and even though your heart will still be pounding and your knees might be shaking, you are courageous. You are mighty because you have made it through hard things. The big hard things, the small ones too, the everyday ones that wear on you so you feel thin and worn out and needing grace. That grace is there for you, outstretched like an open hand, a grace for you, you mighty thing. You are worthy and may I shout this from the mountain peaks and the roof tops and the hills in Rwanda, I will shout it loud for you to hear, echoing over again: you are worthy, you are worthy, you are worthy, and this will be my anthem for you and for me alike. Because you are, and even when you forget it, may I remind you. 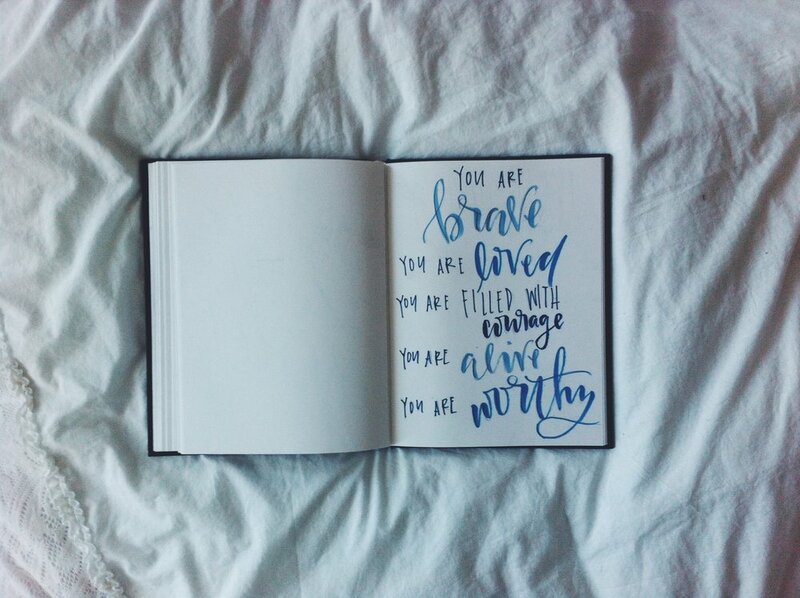 You are worthy. I'll say this to the girl, and maybe she won't believe me, but maybe -- just maybe she will -- and even if she doesn't, I'll keep on telling her. I'll keep on telling you too. And perhaps you'll keep on telling me. If you're busy today, feeling rushed and hurried and un-enough, let me read you this love letter. And maybe after this, you'll carve out a little time and write one to yourself. (Let me tell you: it's not easy. I'm slightly weirded out to even post this, but yes indeed it will be worth it.) Email subscribers, you might need to click over to listen. I have spent a good portion of my twenty years disliking you. I admit: I've been cruel. I've yelled at you, yanked at you, cursed you and wished you were irrevocably different. I've looked longingly at other bodies and then peered down distastefully at you. But that's changing now. And here, right now, perhaps this is where it begins. Let me whisper what I like about you, soft and quiet, and maybe my heart and head will catch up with one another and finally believe it. So, hello my body. Hello. I like you. Do you hear me? I like you. I like you toes, painted dark black and you look so good showing yourselves off in sandals. And I like you feet. You carried me to Africa and back. I liked the red dust that covered every speck of you, and the dull ache in my heel that reminded me of how long it took the children to gather their water. I like you for the feeling of early morning grass and soft sand and bare toes on a hardwood floor. Hello to my knees, you crooked achy things, but you got me excused from grade nine gym class a few times, and that was never a bad thing. And to my legs and thigh gap-less thighs, I like you. I'm not scared to wear shorts or dresses or swimsuit bottoms. I like how you hips hold a dime-sized brown mole on the left side, adjacent to the belly button, right square on the bone. You stomach and you chest -- thank you for filling with deep intoxicating breath. You tell me that I am alive, you tell me that I am living. I like you, lungs. You remind me that I have purpose. Do you remember when you broke, collarbone? I was ten and you broke clean. You're healthy and mended now, and you and my neck do a fine job with displaying my favourite jewelry. You eyebrows lift high in scepticism, but I love your shape. You small nose, the same as my father and my grandmother, you remind me of who I come from. Remind me of who I love. You full rounded lips, you can wear red lip stick and seem sassy and spirited. You can speak things quickly without realization, but you're learning to be slower, more thoughtful. You curve gently over a steaming mug of coffee, and you smile large, so large, so very, very large. And to you, cat-shaped eyes never sure of if you're green or blue, you allow me so many opportunities to see the most beautiful kinds of things. You eyelashes curl while overlooking the Rwandan hills, the never ending ocean, the majestic star encapsulated sky. You brain, you mind, you thoughts that run rampant sometimes what feels like all night long, you allow me opinions and ideas and fathomless possibilities. And you hands, you lovely hands. You're my favourite thing if I had to choose. You feel the nib of a pen, the stroke of a brush, and you can create words and phrases and letters and art. You grasp, you hold, you touch. You have the entire world right there at those fingertips. No matter what I whisper, Body, know this: you are enough, here, right as you are. No matter how I feel or what I think, you are enough. May we dance and laugh and twirl and sing, wearing a wild and dazzling kind of joy, our heart pumping courage, our lungs exhaling strength, and may our enoughness be as distinct and as bold as we ourselves long to someday be. This post was inspired by Sarah Bessey, whom originally was inspired by SheLovesMagazine. This is a challenge for you. I hope you'll take part in it. If you do and you want to share it, feel free to email me or comment your link on this blog. I hope you write love letters to yourself. You are enough, you are enough, you are enough. This is day fourteen. You can find the rest of this series right here. I wrote a letter to Jordan eleven weeks ago today. I don’t know Jordan or very much about Jordan. I don’t know his last name, or how old he is, or if his father is his hero. I don’t know what his favourite colour is, or if he separates all the food on his plate, or if he mixes his mashed potatoes in with his corn, like I do. I don’t know if he reads books all the time, or if his favourite sport is hockey, or if he has three nieces and nephews who he takes to the park on weekends and pushes them on the swing so high, they feel they must be flying. I don’t know if he drinks his coffee black, or full of vanilla cream and sugar, or if he drinks coffee at all. I don’t know if he kisses his mother on the cheek everyday, or if writes himself sticky note reminders so he doesn’t forget, or if he watches Netflix late into the night. I don’t know if he’s angry, or disappointed, or maybe just plain old sad. I don’t know if his whole life has been spent in that chemo suite, or if he was recently diagnosed. I don’t know if it’s his girlfriend that sits in the room, waiting for him after his chemo, or maybe it’s his sister, or maybe it’s a friend. I don’t know what kind of cancer he has. I don’t know why he has to be in a wheelchair when his young frame seems so strong and healthy, but his hairless head bears the signs of the disease I have come to despise. I don’t know if he knows that he is cherished and treasured and captivated by the Creator of the universe. And I don’t know why I can’t stop thinking about the boy I saw in the chemo suite on the day of my mother’s first treatment. So I wrote Jordan a letter. I saw you two weeks ago when my mom was getting her first chemo treatment at Juravinksi. Since then, I have been unable to get you off of my heart. I sincerely hope I don’t seem creepy for writing you this, and I hope I gather up the courage to somehow get it to you. My name is Aliza. I know your name because I heard the nurse call you. Anyways, I wanted to tell you that I have been constantly thinking of and praying for you the past two weeks. I have no idea how you feel about God, but I feel like I need to tell you that He loves you. I don’t know what your story is, but I do know that God loves you. And I just wanted you to know that too. I will continue to pray for you, Jordan. Jesus loves you so much - more than you will ever fully be able to comprehend. I scrawled it on a piece of lined paper and stuck it in a small brown envelope, then licked the sticky lining shut. And my heart pounded loud and my hands shook, and all of a sudden I didn’t want to give my stupid letter to this boy who doesn’t even know I exist. But the breath of God whispered across my heart - yes, sometimes you have to write a letter, because how can Jesus die for me and then I refuse to love on others? My mom gave the letter to the nurse the next week. I know Jordan received it. I have no idea what he thought. Possibly (probably) thinks I am the creepiest person to walk the earth. But sometimes you just have to write the letter. What letter do you need to write? Liv, You are the truest friend I have ever known. You've seen me in every circumstance - the good, the bad, and the very ugly - and still, you love me. Thank you for that. I know I'm your little sister, but can I say how proud I am of you? Because I am proud. So very, very proud. When people ask if we are sisters, I say with pride, "Yes, we sure are. That is my sister." My beautiful sister. I didn't give you enough credit while we were growing up. I'm stubborn and was trying to figure out who I am, and I never told you how much you influenced my life. How much you still do. You have this way of making me feel so special - like all those times when I was in a play or musical and you would try so very hard to fill as many seats in that audience with people that I love. Or when I overhear you tell someone, "I can't wait until Aliza writes a book someday" - and I know you believe in me. And your kindness for others overwhelms me sometimes. When we found out about Mom's cancer, you immediately brought her flowers. It was your idea to make her an entire care package filled with comforting things you know she'd love. When the youth kids come over to your home, you always have food ready for them. You constantly open up your house for people, and I look at you with wide eyes and wonder: how do you do it? You are strong. You are fiercely loyal. You are so, incredibly lovely. And you are my sister. My absolute best friend in this giant world. Thank you, Olivia, for all you have done for me. Thank you for your honesty, your support, your kindness, your generosity, your unfailing love. I could never stop loving you. You are my favourite friend. Happy birthday, my beautiful twenty-three year old sister. My love to you, forever and always.